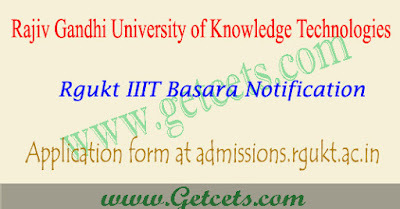 IIIT Basara admissions 2019-20, apply online, Rgukt notification : Rajiv Gandhi University of Knowledge Technologies will publish soon of iiit basara admissions 2019-20 notification on it’s official website admissions.rgukt.ac.in for admission into first year of 6-Year Integrated B.Tech program at RGUKT Basar (Telangana State) for the academic year 2019-2020. 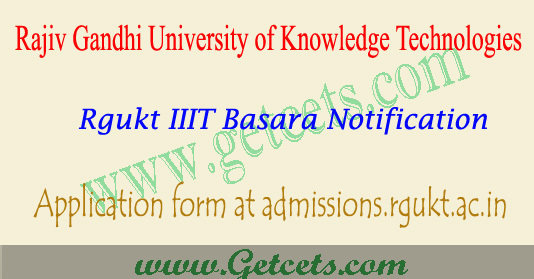 You can check eligibility criteria for basara iiit notification 2019 from the official web portal. And also Basara iiit online application form 2019 available on admissions.rgukt.ac.in from — April 2019. Admission Procedure : Admissions to the first year of Integrated B Tech Program (2019-20) will be based on merit in the Grade Point Average (GPA) and Grade obtained in each subject in 10th class, and by following the statutory reservations of the State. A deprivation score of 0.4 prescribed by the Government for the year 2019-20 under Statute 13 (3) shall be added to the 10th class GPA of those applicants who studied in non-residential Government Schools including the Zilla Parishad and Municipal Schools, with an objective of providing weight age to the socio economically challenged students in the admission process. Rajiv Gandhi University of Knowledge Technologies is inviting applications from the eligible and interested Students who are seeking to get admission in 6-Year Integrated B.Tech program. Interested Students can fill the Rgukt IIIT Basara 2019 Application Form from the official web portal admissions.rgukt.ac.in. IIIT basara applications will begin from April 2019, online application available till May , 2019.